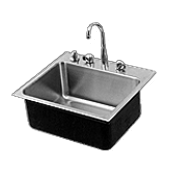 Just Manufacturing’s selection of heavy duty institutional single bowl stainless steel sinks and are ideal for all institutional projects. 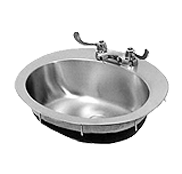 Just Manufacturing's heavy duty single bowl stainless steel sinks have been the preferred choice of architects, designers and specifying engineers and have have been specified by some of the largest health care groups, school districts and hotel chains in the U.S. since 1933. The hard metallic surface of stainless steel makes it difficult for bacteria to adhere and survive. When properly cleaned and maintained, stainless steel surfaces resist growth of bacteria, mold and microorganisms that can cause disease. Easy cleanability makes stainless steel the first choice for strict hygienic conditions. 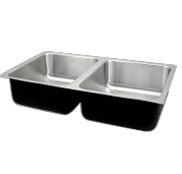 Through close customer communications and innovative product development like our Integra-Flow overflow, vandal-resistant system, the Just product line of institutional single bowl stainless steel sinks has evolved to become a comprehensive, application-specific product offering that is preferred by most commercial end users. 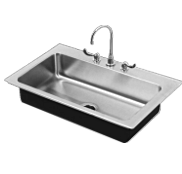 Institutional stainless steel sinks are available in six (6) ledge type variation configurations as well as wall-hung and cabinet top mount stainless steel sink models. With over 150 standard and ADA models in our catalog, Just Manufacturing is an industry leader in institutional stainless steel sinks and plumbing fixtures for schools and other institutions. Our Integra-Flow overflow, vandal-resistant faucet and bubbler ledges - an industry first! With the broadest product offering of single bowl sinks to the food service industry, you can choose the exact sink model needed for a particular installation without sacrificing cabinet or sink sizing restrictions. Just Manufacturing has a 80+ year track record so you can be assured that quality service and product reliability are a constant. Need something unique for your spec sink project? 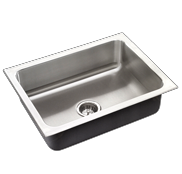 If a stock sink is not the answer, we are experts in custom stainless steel sinks for many applications ~ no project is too small for a custom sink that is "Made in the USA". Our commercial grade stainless steel sinks and commercial plumbing fixtures exemplify our ongoing commitment to product development. 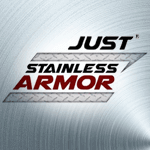 Just Manufacturing uses 18-8 type 304 certified USA milled stainless steel to produce the best stainless steel sinks available. 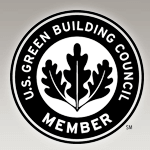 All Just Manufacturing stainless steel sinks are Made in USA and certified for ARRA project work specifications. Our comprehensive product catalog offers fixtures for a large variety of applications including residential, institutional, medical and commercial! We are constantly upgrading and improving our JIT process to meet the needs our customers. 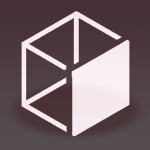 Just-in-time (JIT) is an inventory strategy that strives to improve a business's return on investment by reducing in-process inventory and associated carrying costs. Just Manufacturing provides unparalleled commitment to JIT (Just In Time) in the building materials product market. 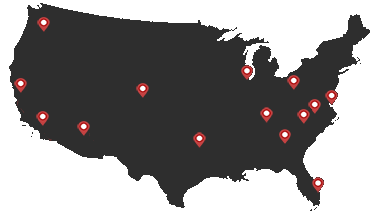 Just Manufacturing is your partner for Just-in-Time sink inventory management. 95%+ off-the-shelf fill rate so you have fast delivery on your sink order. Stainless steels need to be cleaned for aesthetic considerations and to preserve corrosion resistance. Some form of routine cleaning is necessary to preserve the appearance and integrity of the surface. 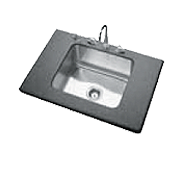 Stainless steel sinks are easily cleaned by many different methods. They actually thrive with frequent cleaning, and, unlike some other materials, it is impossible to “wear out” stainless steel sinks by excessive cleaning. Much of the beauty of a stainless steel sink lies in its long-lasting wear and enduring good looks. The key to keeping stainless steel "stainless" is proper care and maintenance. Follow these few simple steps, and your stainless steel products from Just Manufacturing will retain their original professional look for many years to come. 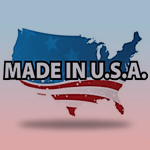 Secure your ARRA (American Recovery and Reinvestment Act) project stainless steel sink specifications with Made in USA plumbing products from Just. 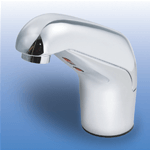 Comprehensive offering of deck-mount, backsplash, goose-neck, AC & DC powered commercial sensor faucets. 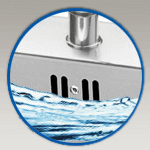 Lavatory offering includes deck-mount single or two-hole option installation. In-plant production as well as inbound raw materials and packaging are factored in to our GREEN planning recycling efforts. 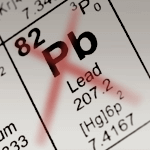 Just Manufacturing offers a comprehensive line of commercial Lead-Free products that comply with the U.S. Safe Drinking Water Act. 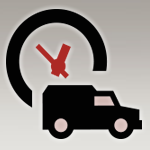 95%+ off-the-shelf delivery; Just Manufacturing is your partner for Just-in-Time inventory management.